Many may give complicated definitions of what Nintendo LABO is, but all of them agree that it is a cardboard box filled with more cardboard. That said, it sounds like Nintendo is kidding us, because nobody would pay $ 60 per card, right? The point is that the cardboard inside LABO brings us surprises. With the contents of the box you can create shapes that you can attach to your Nintendo Switch. The creation of these new forms takes to a new level to play video games, because it offers a world of possibilities beyond those that are standardized in the box. The idea is simple, but at the same time it has many benefits that parents can find very attractive; after all, they are the ones who are going to pay the LABO price. What makes the Nintendo proposal so interesting? For me it is more than clear: it brings its users closer to its most creative side, it relates handicrafts with video games, and that sells the whole idea to parents, it is so because their children are not playing video games all day, they spend part of their time inventing new things. LABO knows how to be attractive to the end user, because there is no doubt that assembling these figures on cardboard is of great interest for young and not so young. 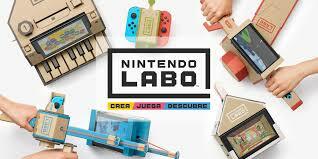 Another of the positive points that LABO brings us is the personalization of the standard creations that come in the box, because they bet on the individual. Until now, the Nintendo consoles (or any brand) were standard for all of us, perhaps changes in colors were seen, but not much further. LABO is made of cardboard, and therefore asks to be personalized, to be painted, to be decorated and that, once again, points to the development of the creativity of its users. These are not just figures that look pretty together with your Nintendo, but give it functionality. We could say that they are additional elements that facilitate the game, or that, in many cases, help to get better into the story. Imagine you are playing a motorcycle video game, with the shapes you create in LABO you can create handlebars that allow you to simulate a more realistic environment. LABO is about to go to the market and we are already very anxious; We want to have our cardboard kit as soon as possible to start creating. The price may not be so attractive, but, for the possibilities it offers, it seems that it will be a sales success.